Mike Yee is a pioneer of the Three-Point, Double-Strap System, created by combining a Crotch Anchor (Point 1), Knee Strap (Point 2), Thigh Strap and Ankle Anchor (Point 3). Mike’s innovative bungee system suspends the thigh straps from the hull of the boat just below the gunnels and the knee straps from the bag cage. This keeps the straps in a hooped position, ready for a quick entry. By connecting the Thigh and Knee Straps, only a single pull is required to tighten the entire system, making it the fastest, most secure, and safest outfitting system on the market today. When properly installed, escape is fast and easy. You have the ultimate in boat control when you combine the Three-Point, Double-Strap System with a Mike Yee Pedestal and Knee Cups. This full position system provides maximum contact between you, the outfitting, and the hull of your boat. The transfer of energy from your body to the paddle and boat will be more efficient and fluid. All of these elements combined will enhance your skills, control, safety—and enjoyment! Determine price by adding the costs of the pedestal along with double strap system and bag cage kit. For tandem whitewater set-up, order two full positions and a bag cage kit. 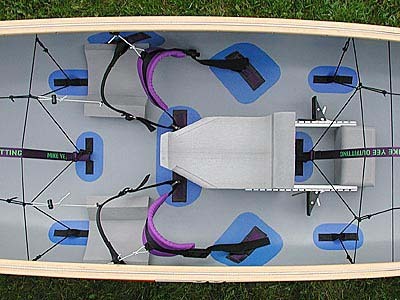 For triple whitewater set-up, order three full positions and a bag cage kit.